Are you thinking of hosting a St. Patrick’s Day party? If so, then you’re probably looking for some creative ideas to make the celebration a hit. Send the invitations out about 10 days prior to the party date, giving your guests enough time to RSVP and prepare for the party. Inside the invitations, attach a note, asking guests to dress for the occasion. Encourage them to come in full costume or practice the “Wearin’ o’ the Green.” At this time of year, dollar and discount stores sell leprechaun hats, shoes with curled toes, green hairspray, green boas, and lots of other interesting party props! Some fun St. Patrick’s Day party invitations you can make. For an informal dinner, serve a buffet that includes corn beef on a bun. You can order the green buns from the local bakery and pick them up the day of the party, or make homemade green bread. For a sit-down St. Patrick’s Day dinner, cook up a big pot of corned beef and cabbage or make a centerpiece of boiled corned beef with vegetables. You can also make green mashed potatoes, by simply adding a few drops of green food coloring when you add the milk and butter to the mashed potatoes. Mix well and presto… green mashed potatoes! If you’d rather serve sandwiches, make green sandwich bread, then cut the bread out with a shamrock cookie cutter and add green food coloring to make green egg salad or green tuna salad. For dessert, serve a St. Patrick’s Day cake or shamrock sugar cookies with green icing. 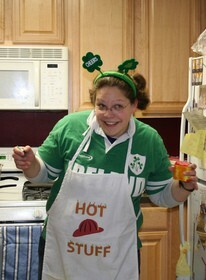 You can also purchase small Irish flags at the dollar store and use them to decorate your food items. Serve green drinks (both alcoholic and non-alcoholic). Of course, green beer is always a hit. Place a large paper mache rock in the foyer so your guests can kiss the Blarney Stone as they enter. Irish legend says this will fill them with blarney, which means they will be very talkative. This fun activity will keep the atmosphere light (and you might even learn a few secrets about your guests). Add a few St. Patrick’s Day games for lots of laughs. St. Patrick’s Day party favors could be used as prizes. Play a game of Irish trivia. You can find Irish trivia questions and answers online or at your local library. Have your party guests write an Irish limerick. Subjects might include leprechauns, an Irish lass, faeries, dragons or other Irish traditions. And no St. Patrick’s Day party would be complete without a pot of gold and instructions for how to catch a leprechaun. The pot of gold will lure leprechauns to your party. Plastic green pots can be purchased at party and dollar stores, as can large black cauldrons. Fill one with chocolate coins wrapped in gold foil. Then, make a heavy cardboard rainbow that stretches out of the pot and arches high against the wall. You might want to ask a talented friend to set up a face-painting table. Kids and adults alike will enjoy getting in the spirit with a green shamrock painted on their face. St. Patrick’s Day face painting is sure to be a hit. Add lots of green shamrocks to the table (here’s a shamrock template) and check dollar and party stores for St. Patrick’s Day decorations. Place green Christmas mini lights all over the house — even around your St. Patrick’s Day table and centerpiece. Lots more St. Patrick’s Day craft ideas here.